Geoengineering is the deliberate and large-scale intervention in the Earth’s climatic system with the aim of reducing global warming. It is most often thought of in terms of carbon dioxide removal or solar radiation management but a third approach using the cooling of ocean surface waters and the surrounding atmosphere with cold water brought up from the oceans depths has also been considered. Thermodynamic geoengineering is a fourth way. 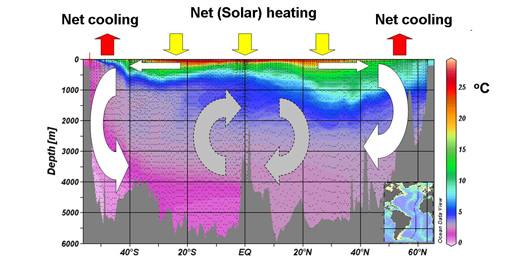 Thermal stratification of the oceans (Figure 1 to right) induced by global warming presents the opportunity to convert warming heat to productive energy. 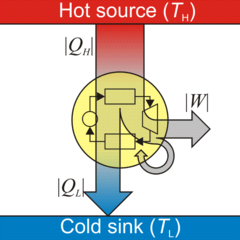 The 2nd law dictates that heat flows from warm to cold. The majority of warming heat is accumulating in tropical waters. The ocean depths are a vast cold sink but the density issue makes it difficult for tropical heat to flow into the abyss. The avenue of least resistance is for tropical heat to move towards the poles where it is melting icecaps and permafrost that is locking in methane; a potent greenhouse gas the release of which would create a dangerous warming feedback. Damaging tropical storms are one of the main mechanisms of heat transport from tropics to the poles. Although CO2 emissions have continued to rise (Figure 4 to right) it is thought that increased ocean heat uptake has caused an atmospheric warming slowdown this century. The forces believed to have brought about the mixing of surface heat into deep waters are wind and density issues associated with the melting of polar ice. Both of these are believed to be temporary phenomena that when reversed will see much of the so called missing heat returned to the atmosphere. Heat pipes are sometimes described as thermal superconductors because they rapidly move heat through phase changes of a working fluid. They are a highly efficient way of conducting heat away from a region where it can do harm, as with the ocean's surface. The heat pipe’s efficiency stems from the fact they have no moving parts yet they can transport heat at speeds approaching that of sound. They can move heat counter to the forces of gravity and when a turbine is situated in the vapor stream heat can be converted to work. With enough of these devices the hiatus can be perpetuated while generating as much energy as is currently derived from fossil fuels. The efficiency of a heat engine is equal to 1 – the absolute temperature of the cold reservoir divided by the absolute temperature of the hot reservoir. Ocean thermal energy conversion (OTEC) requires a delta T of at least 20 degrees. Universally the oceans at a depth of 1000 meters are about 4oC or 277K so the theoretical Carnot efficiency of a minimally operative OTEC system would be about 6.75%. Realistically 5% is about the best that can be achieved, which means 20 times as much heat has to be moved away from the surface of the ocean as energy produced. It has been estimated the oceans are capable of an output of about 14 terawatts (TW) of primary energy without creating environmental damage. This is about what is currently derived from fossil fuels. 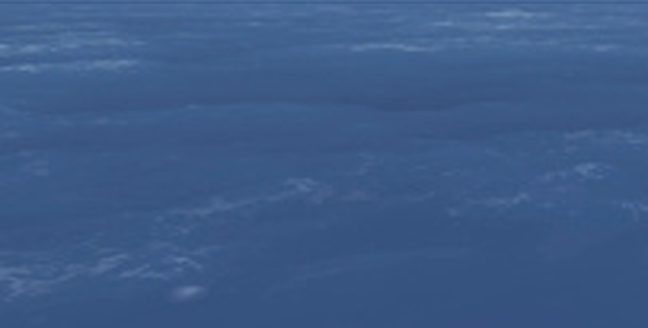 To convert ocean heat to that much work would require the transmission of an additional 280 TWth into the deep through heat pipes and since NOAA estimated in 2010 that the oceans are accumulating about 330 TWth due to climate change, virtually all of this excess energy can be converted or relocated to the safety of the abyss with heat pipe OTEC. This would short circuit the movement of heat towards the poles by moving it to an ocean depth where the coefficient of thermal expansion of sea water (Figure 5 to right) is half that of the tropical surface. By sapping as well the energy of tropical storms these systems would ameliorate the two greatest risks of climate change; sea level rise and storm surge. It is estimated that at depths from 500 to 2000 meters, the oceans are warming by about .002 degrees Celsius every year, and in the top 500 meters, they’re gaining .005 degrees C. In contrast the atmosphere has been warming about 3 times faster than the deep ocean and the poles 3 times faster than that. 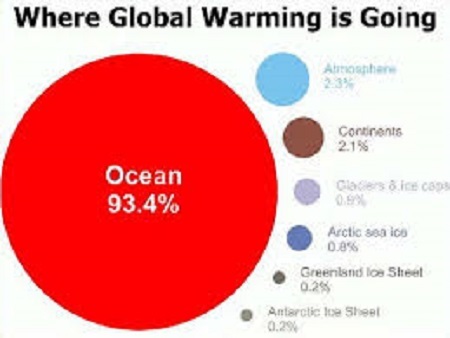 It is apparent therefore that the deep oceans have the greatest capacity to accept the heat of global warming while producing the least temperature increase because of their huge heat capacity. 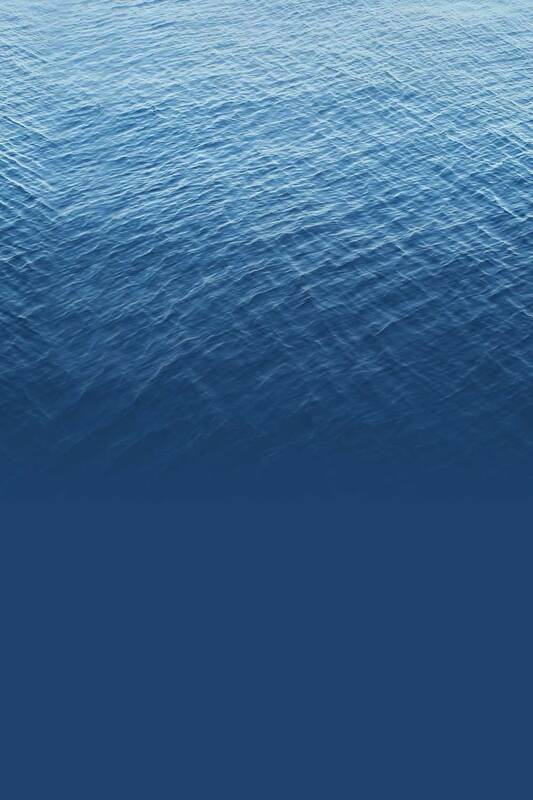 To get ocean derived energy to shore requires the conversion of electricity to an energy carrier. Electrolysis of sea water can be done in such a way that not only is hydrogen produced, carbon dioxide is sequestered with the formation of carbonates and bicarbonates and these in turn neutralize the increasing acidity of the oceans brought on by increasing CO2 uptake. Heat pipe OTEC (Figure 6 to right) addresses both the cause and effect of climate change. Heat uptake in the deep oceans is believed to be the reason for the atmospheric warming slowdown experienced this century. This natural phenomenon is replicated with heat pipes that are part of a system that produces energy in a heat engine. Although the natural phenomena are expected to reverse within a few decades, heat moved to an ocean depth of 1000 meters would take about 250 years to return given that upwelling in the Pacific is estimated at about 1cm/day. As this is an emissions free approach to producing energy, atmospheric concentrations of CO2 would be reduced by the time the heat reemerged, at which point it could be returned to the deep with the same process. Heat moved into the deep is no longer available to drive tropical storms or to migrate towards the poles where it would melt icecaps and permafrost. 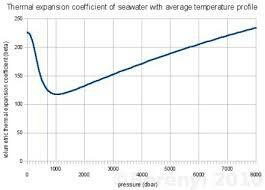 The thermal coefficient of expansion of sea water is half at an ocean depth of 1000 meters that it is at the tropical surface thus sea level rise would be reduced due to this effect as well. Thermodynamic geoengineering provides a lot of environmental wins in a single package.